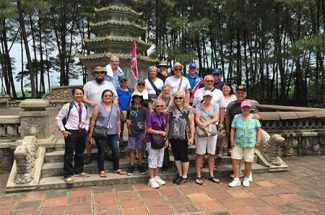 From glorious jungle-tangled temples in Angkor to the wonderful Luang Prabang with its amazing temples and markets, Indochina Tours brings tourists a chance to step into the cultural treasures and natural splendors in Indochina. 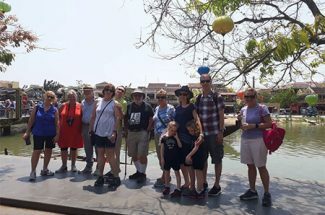 Upon arrival in Siem Reap, spend two days of your tour exploring the splendid temples in Angkor Wat and Angkor Thom from the small circuit to the large ones. The following day, take a boat out to the lake village to see how people adapt to life on this unique ecosystem. Next, fly to Vientiane to have a two-day city tour, and move to Luang Prabang. Spend one day in Kuang Si Waterfalls swimming in the crystal–clear waters. You will admire thousands of Buddha images at the oldest temple in the capital and discover more during a riverboat trip to Pak Ou caves. Enjoy your trip! Welcome to Cambodia! 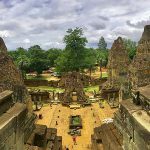 Your memorable Cambodia & Laos Tour will start by discovering the fantastic world heritage temples in Siem Reap, Kingdom of Cambodia. Upon arrival, you will be welcomed and escorted to the hotel by your local guide. After check-in and a short rest, your private guide will lead you to explore the world’s wonder site – Angkor Wat, the magnificent temple was built in the 12th century and it is the largest first Hindu, Buddhist temple complex and the largest religious monument all over the world. 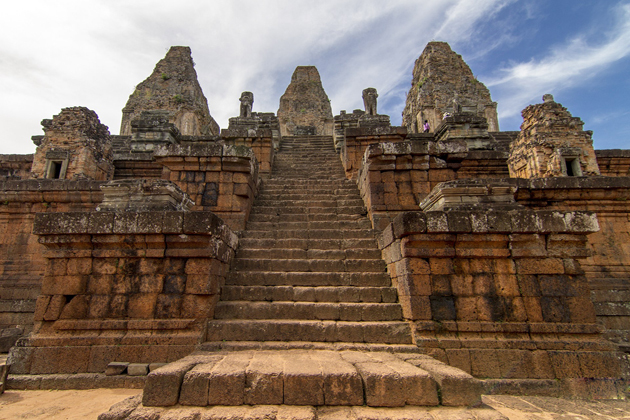 En route back to Siem Reap, enjoy the sunset from the top of the pyramid-shaped temple of Pre Rup. 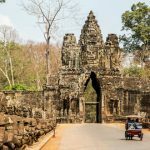 After breakfast, the cool weather and less traffic are perfect for you to travel in a Tuk Tuk to explore the ancient city Angkor Thom which was the last and most enduring capital city of the Khmer empire. 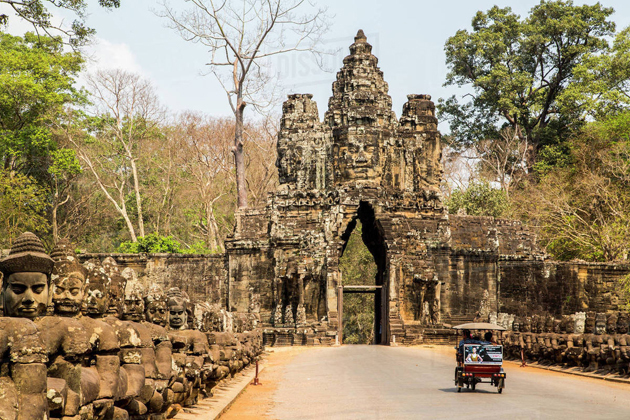 Enter Angkor Thom through the South Gate. 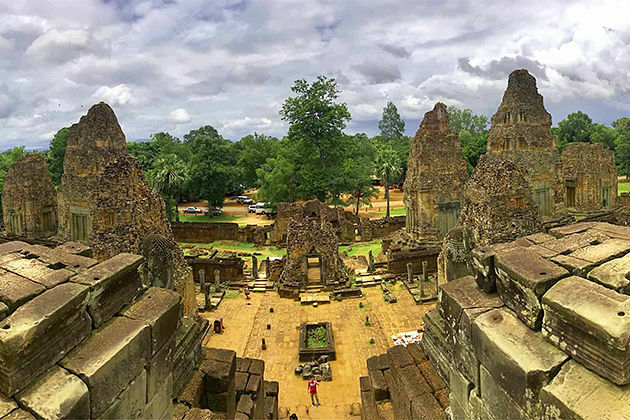 Your private tour guide will lead you to catch sight of the most exquisite examples of Khmer architecture including the stunning temple of Bayon at the center of the city. 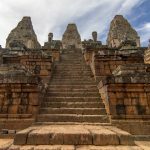 Here, you can find Apsara dancers, Hindu gods and ancient stories carved into exquisite images in every inch of its structural stones. 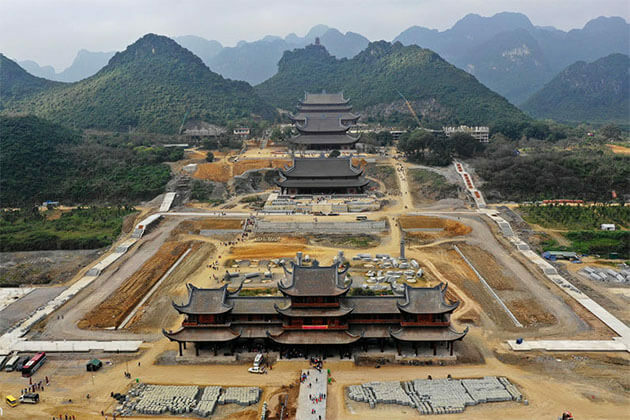 You can also visit the Terrace of Elephants, the Royal Palace, and the Terrace of the Leper King. 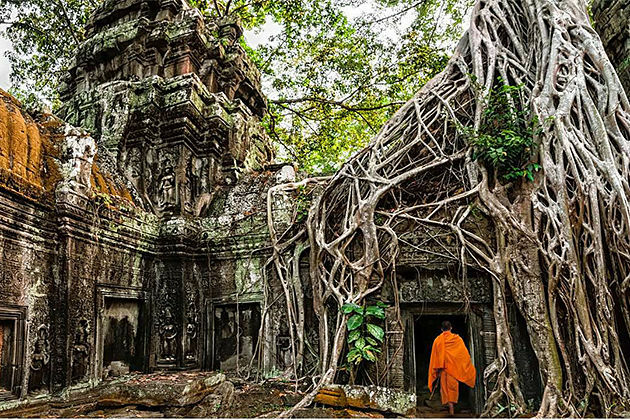 Following your lunch, a visit to the hugely popular Ta Prohm Temple comes next. 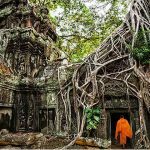 Also called ‘Jungle Temple’, Ta Prohm has a wide range of centuries-old trees growing through the ruins with roots going everywhere, adding atmosphere to the site. Here, you observe the incredible way the golden sprung trees have wrapped the ruins in a tight embrace. Don’t miss to snap a few photos. 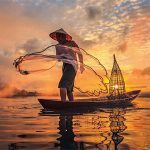 Today, your Spirit of Cambodia and Laos Tours continue by a half-day excursion to the biggest Southeast Asia’s largest freshwater lake – Tonle Sap Lake. 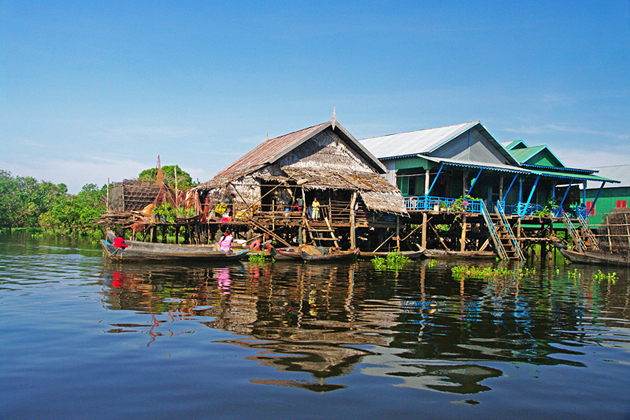 Cruise along Tonle Sap Lake, stop to discover the lively floating village of Chong Khneas along the way. 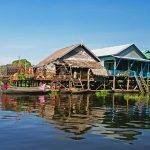 Remember to keep your camera to hand as you wind through the dramatic scenery of the flooded forest and admire the stilted houses of Kompong Phluk. 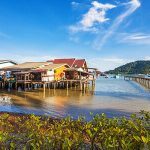 Finally, tuck into a delicious buffet lunch at the Tara floating restaurant, then sip a cocktail and relax in a hammock as you soak up the views. Your afternoon is free at your leisure. Enjoy the free morning until transfer to airport for onward flight to continue your journey to Vientiane, the capital city of Laos. When arriving, you will meet your local guide and driver. After check-in, enjoy the rest day to relax. 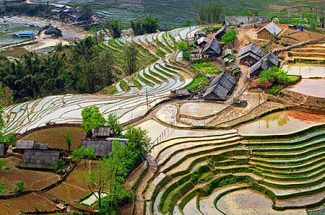 Indochina Tours recommends you to walk around the hotel to discover the city or stroll along the river bank to enjoy the beautiful sunset. 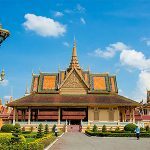 Vientiane, the charming capital city of Laos, home to the rich heritage of Buddhist culture, is waiting for you to discover. After breakfast, your full-day city tour will take you to visit the highlights of Vientiane. 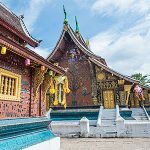 You will firstly get to know some more history of Laos by visiting the National Museum, where you can find the collection spans prehistoric tools and pottery to ethnic clothing and household goods. 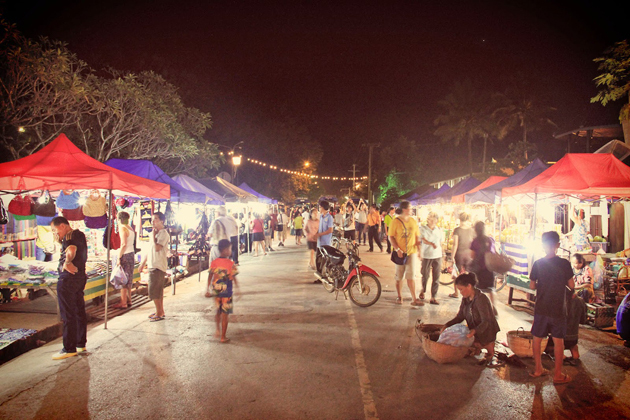 A large collection of party memorabilia and modern Lao history is also housed and preserved here. Next, visit the temple Wat Sisaket which is the oldest surviving temple with thousands of Buddhist images. 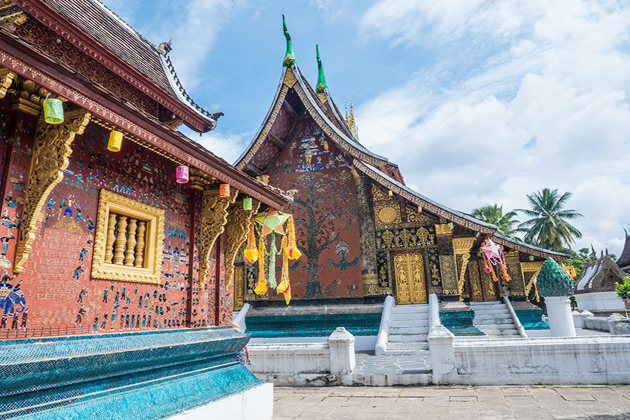 Head to the Temple Wat Prakeo which housing the famous Emerald Buddha image really amazed the Indochina tour makers. Your full day Vientiane city tour will not be completed without a visit to the symbolic site That Luang Stupa and Patuxay Monument. 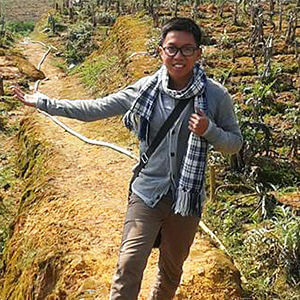 After breakfast, continue your amazing Cambodia and Laos Tour by a short flight from Vientiane to Luang Prabang. Upon arrival, you will meet your local tour guide and driver, then be escorted to the hotel and take time to relax. 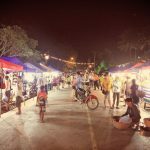 In the evening, Indochina Tours recommends you to wander around the night market to discover the local lifestyle of Luang Prabang and immerse yourself in a variety of colorful products. Sample some of specialties or dip in a drink here are fascinating options here. 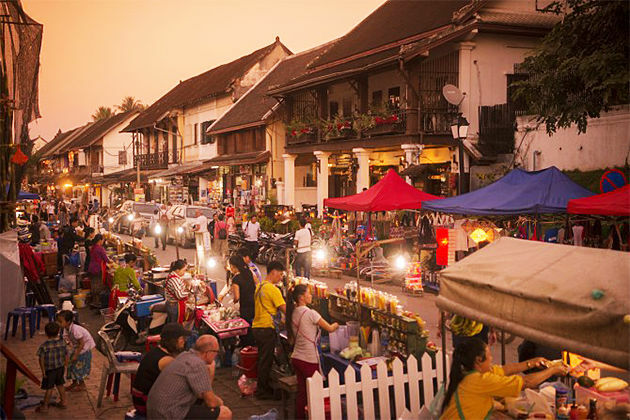 Luang Prabang, the cultural capital of Laos, has numerous destinations to explore in order to learn about the Laotian traditions and lifestyle. 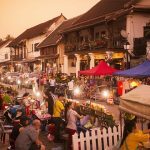 Everything in Luang Prabang is special and exotic, from the food, in its ingredients and preparation to the silk weaving skills and art. 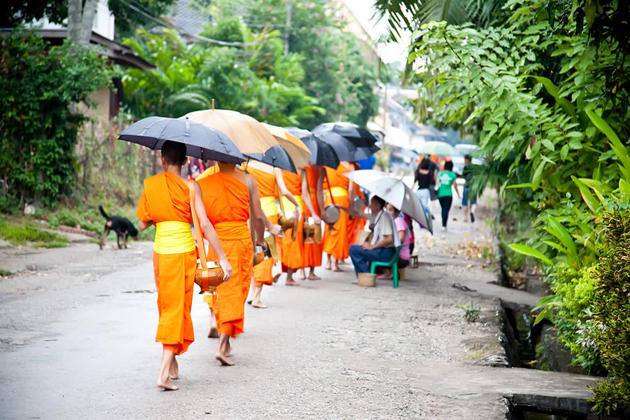 In the morning, opt to discover the beautiful city from taking part in an Alms Giving Ceremony, which is a longstanding tradition in Laos Buddhist culture. You should tell your guide at least 1 day in advance if you wish to join so that he/she can prepare some offerings. 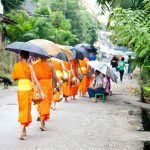 Then you arrive and follow the guidance of the locals by kneeling down ready to give them to the monks (most common gifts include rice, fresh fruit, and traditional sweet snacks). However, it’s is optional that you just observe the rituals from the other sides of streets. Whatever you decide, you have to dress and behave respectfully during the rituals. Don’t get dressed in clothes not covering your shoulders, chest, and legs. After that, return to the hotel for breakfast or join the locals for a bowl of delicious noodle. 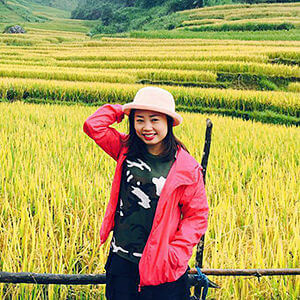 Next, have breakfast in the hotel and continue your trip to Kuang Si Waterfalls, where you will marvel at the stunning natural scenery, play in the falls and relax. Then drive back to town for lunch. In the afternoon, take a half-day Luang Prabang city tour through the highlight destinations including: Wat Xieng Thong, which presents a fine of example of the classic Luang Prabang architectural style with sweep-tiered roof and ornate mosaics including ‘tree of life’ glass montage on the rear temple wall; Royal Palace Museum, which was built in 1904 for King Sisavangvong after the previous palace was destroyed by invaders in 1887. The museum is well worth visiting to learn more about Lao history and culture. Then visit Wat Aham Temple which means ‘Monastery of Opened Heart’ and the Stupa of Wat Visoun. 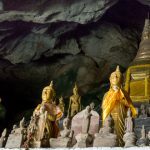 Today, stray from the paved streets of Luang Prabang and journey on the long, winding Mekong River to discover the ancient wonders of Pak Ou Caves. 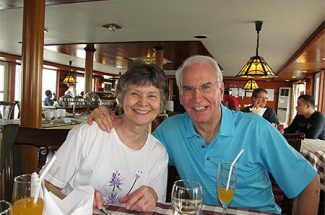 Along with your local guide, the adventure begins with a relaxing trip aboard a charming cruise which is designed for comfort and for marveling at the scenic riverine views. Enjoy the wide open spaces and freely gaze upon verdant landscapes as you make your way to the first stop of the day. Located in a remote island, wander the temple shrine of Wat Done Khoun Nesmith, a place of retreat for monks in search of enlightenment. Then back to the river, head north to the stunning Pak Ou Caves. 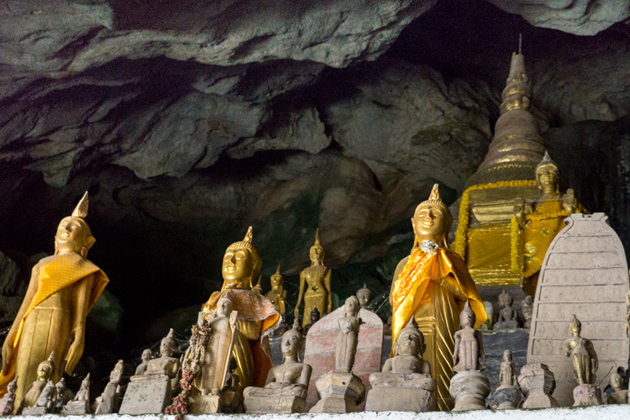 From anywhere you look, the limestone faces of the caves are filled with ornate carvings of over 4,000 Buddha images that have fascinated locals and worshippers alike. After visiting, take a boat back to the town and relax for the rest of the day. 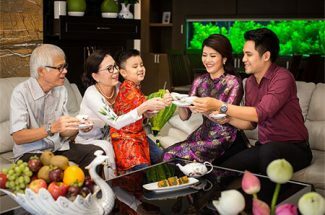 Enjoy relaxing time in the morning until transfer to the airport for onward flight to your home. We wish you to have unforgettable memories with our itinerary. Enjoy your vacation!